Project proponents often say: “The golf course is already there! Why not just approve the project?” The answer is that The Ridge at Trinitas proposal requests entitlements to do much more. The environmental impacts of constructing and maintaining the golf course represent only the tip of the iceberg. 22,000 sf 30-unit lodge/motel, with “day spa,”* retail area, and outdoor pool; *In a Rotary Club presentation on Feb.5 ‘09, the applicant described a 25,000 sf. clubhouse - 40% larger than previously stated - and a 10,000 sf. spa in the lodge. Apparently the Project Description is still a moving target! The Project Site includes 280 acres on Ospital Road between Highways 26 and 12, in western Calaveras County. The parcels are identified as APN# 050-052-41 and 050-052-42. In comments on the Trinitas DEIR in 2007 and RDEIR in 2008, Central Sierra Environmental Resource Center (CSERC) staff suggested the Final EIR include Alternative 4: Regulatory Compliance Alternative. “Under this alternative, the applicant would not gain any approval for developing the clubhouse, lodge, associated parking lots, or any accessory structures. The applicant would not be authorized to open up the golf course for any commercial use by members of the public. The applicant would not receive approval for 13 new residences, nor for the drilling of any new wells. The applicant would not be given approval for any commercial operation or any related enterprise that would benefit from the unauthorized, non-permitted, illegal construction of the golf course that was initiated during the time period when the property was under Williamson Act contract. Rather, under Alternative 4, the applicant would be directed by Calaveras County to bring his property into compliance with its General Plan designation and existing zoning and to also move to correct unapproved actions.” CSERC_9-26-08, p.10-11. See complete comments Exhibit 046. Comments submitted by CSERC to the Planning Commission Feb. 19, 2009 again proposed consideration of this Alternative. Zoning Adjustment (ZA) from Agricultural Preserve (AP) – to Recreation/Existing Parcel Size/Planned Develop-ment (REC/X/PD). The REC zoning is necessary to make the golf course legal, and to make the commercial enterprises tied to the golfing facilities permitted uses. The X/PD zoning allows a “density transfer” and “clustered” housing on 2- to 5-acre parcels, while “maintaining” the ratio of one residence per 20 acres. Conditional Use Permits (CUP) for the lodge facilities, the restaurant, parking lots, and continued agricultural production in the Recreation zoning. Administrative Use Permits for special events under 1,000 people. DEIR Figure 3-6: Proposed Subdivision and Improvements Plan. 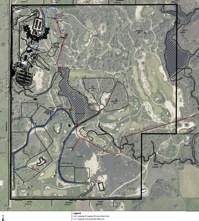 A 2004 AirPhotoUSA aerial of the Trinitas property shows some of the 95 acres stripped of natural vegetation and graded to install greens, fairways and miles of golf cart paths. See other aerials of the site before and after construction. See FEIR Volume 1, Chapter 4 for the analysis of Project Alternatives. The Staff Report to the Planning Commissioners recommends: APPROVAL of the ZA to REC to open golf course legally, and CUPs to build a limited clubhouse/pro shop and continue commer-cial olive production/retail sales; DENIAL of the X/PD and TSTM for the houses, denial of CUPs for the Lodge/Spa, restaurant and banquet facilities.